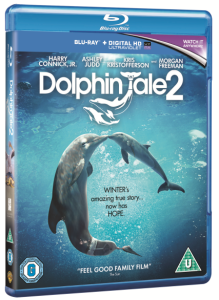 Dolphin Tale 2 is out now on Blu-ray™ and DVD! It’s a race against time to find a new pool-mate for Winter! Dolphin Tale 2 is making a splash on Blu-ray™ and DVD! It’s the sequel to Dolphin Tale and the action returns to the Clearwater Marine Aquarium – home to star dolphins Winter and baby Hope, who are both back on the big screen! It’s a few years on from the first film and Winter’s surrogate mother, the very elderly dolphin Panama, has sadly passed away! Click here to get your copy of Dolphin Tale 2! The movie stars Oscar winner Morgan Freeman as the creator of Winter’s prosthetic tale Dr. Cameron McCarthy, Nathan Gamble as Winter’s owner and companion Nelson Sawyer, plus the rest of the entire Dolphin Tale cast! Dolphin Tale 2 is available now on Blu-ray™ and DVD.